Divine 9 Dance | Level 2: Free the Sensual Woman in You! How to increase your beauty, charisma, vitality and souplesse! time to put water on the fire and dive into the sensual waves of your femininity! Enhance your Royal posture with the sublime ‘Elegance & Grace’ dances. Increase your charisma for an irresistible self-expression with the ‘Snake Hands & Arms’ dances. Clear your womb with ‘I Clean My Ovaries From Sorrow’ with the Full Body Snake dances. Travel light & with grace through life’s challenges with the ‘Forget & Forgive’ and ‘I Rise like a Phoenix from my Ashes’ dances. Put your boundaries with a gracious assertiveness with the ‘Chest Shield’ and ‘Dare To Ask’ dances. Become more spontaneous & authentic with the ‘Sufi Trance Rituals’, ‘I Drop My Masks’ and ‘See with the heart, the essential is invisible to the eye’ dances. Unfold your wings of attractiveness with the ‘Sensual Tornado’ dances. Widen your sensual horizon with the ‘Infinite Flow Lemincates’ dances. "With the online course you can deeply dive into ONE movement. It is very technical and repetitive so you can thoroughly understand the movement and do it yourself over and over again. You do it on your own, but not alone, cause all the ladies in the video join you!" The Divine9Dance Therapy® is a self-healing and self-empowerment practice which allows you to heal your wounds and transform them into empowering experiences. The program curriculum offers you enough material and exercises to develop and polish these self-healing and self-empowering skills. As extra support, Kaouthar offers you live coaching sessions. The live coaching is not necessary to learn and master the Divine9Dance Therapy® method. These sessions are the ‘cherry on top of the cake-curriculum’. Kaouthar offers them as a special gift to increase your motivation and commitment during your learning experience. During these live coaching sessions, Kaouthar will guide you through ‘practical processes’ where you learn how to integrate these new skills in your daily life. 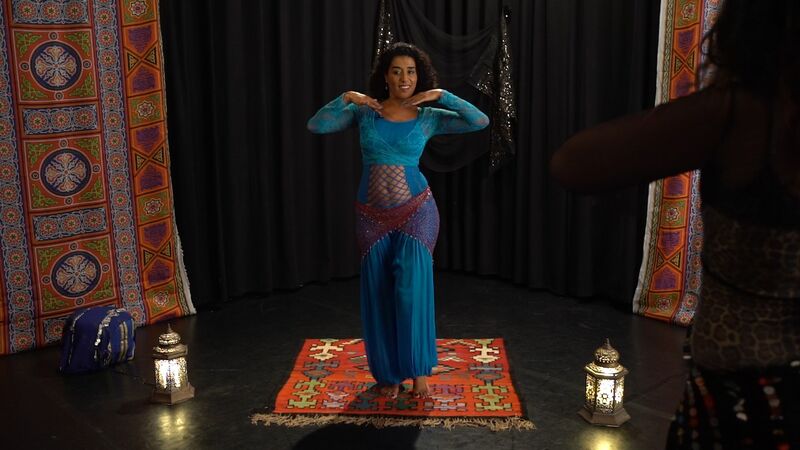 Kaouthar will also give you personal feed-back about your (dancing) questions and issues. These sessions are planned once a month and last between 60 to 90 minutes (See Community Schedule for dates). 1. Each student learns the self-healing and self-empowering skills through the Divine9Dance Therapy® curriculum. 2. All students support each other to learn together inside of the online community, the ‘Sisterhood Community’. 3. All women use the ‘Sisterhood Community’ as a bedding to bundle their power and become ambassadors of the FeMale Balance in the world. Below you'll find the lessons programme. The Content and assignments are discussed the Live session for direct feedback from Kaouthar. The Live coaching sessions are planned on Sunday 10AM PT & 7PM EUT (PT = Pacific Time, EU = European Time). See Community Schedule for dates. Week 20: ”See with the heart. The essential is invisible to the eye” Le Petit Prince. "Participating in the online training has given me deep technical insight in the movements and a good understanding of how I can use which movement in an emotional process. " "],"column-subtitle":["Free the Sesual Woman in You","Free the Sensual Woman in You"],"column-description":["\n\n\n\n\n\n\n\n\n\n\n\n\n\n\nBelow you'll find the lessons programme. The Content and assignments are discussed the Live session for direct feedback from Kaouthar. ","\n\n\n\n\n\n\n\n\n\n\n\n\n\n\nThe Live coaching sessions are planned on Sunday 10AM PT & 7PM EUT (PT = Pacific Time, EU = European Time). See Community Schedule for dates. ","